Wentz at the Blender Sessions at the Hard Rock Hotel in 2007. Peter Lewis Kingston Wentz III (born on June 5, 1979) better known as Pete Wentz, is an American musician and songwriter. 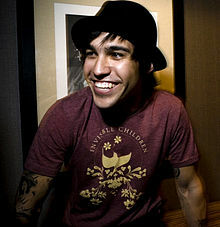 He is most famous for his work with the Chicago-based band Fall Out Boy. In recent years, he has also become an entrepreneur and the host of the MTV program, FNMTV. Wentz has been diagnosed with bipolar disorder. Ashlee Simpson divorced him. Fall Out Boy came off hiatus in 2013, releasing a new single "My Songs Know What You Did in the Dark (Light 'Em Up)" and an album Save Rock and Roll, along with a supporting Spring tour. They will be going on the Save Rock and Roll Arena Fall Tour this September with pop punk group Panic! at the Disco and rapper Big Sean in support of the album as well. ↑ Apar, Corey. "Pete Wentz Biography". Allmusic. Retrieved 2008-11-10. This page was last changed on 8 January 2018, at 23:25.